By W. H. Luyties, editor OWOE. It seems that bashing Tesla is the favorite topic for the financial news media. Whether it’s a story about Tesla’s profitability, production woes, product quality, lack of a real market, impending competition from “real” automakers like Volkswagen, or the behavior of Elon Musk, the message is clear – Tesla is all hype with no substance and destined to fail. Apparently, the only question is when. In the present world of “fake news”, social media “bots”, and a news climate that only values the bad, how does a normal person wade through all the BS and make a good decision on what car to buy? Well, I have the answer…just go drive a Tesla Model 3. Until you have the experience of driving a Tesla, you won’t truly understand how it has changed the concept of an automobile. 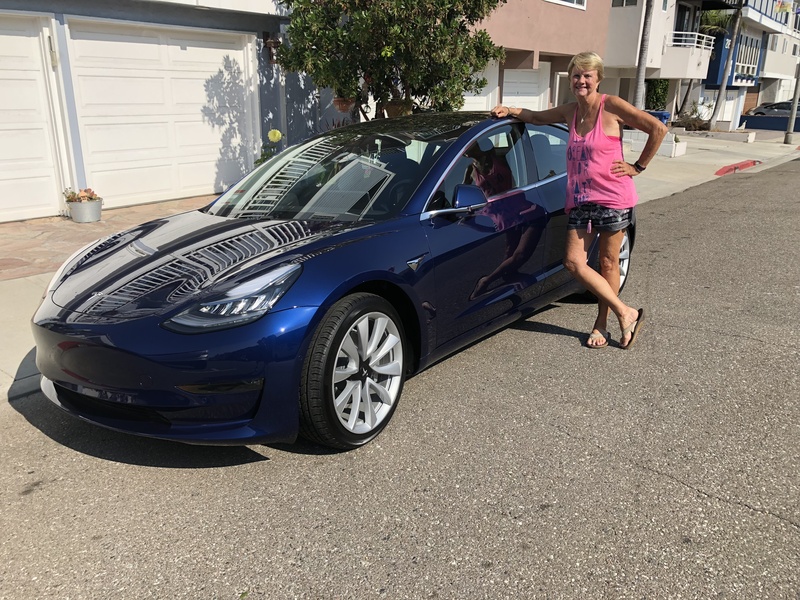 My wife and I are the proud new owners of a Tesla Model 3, a car we bought on pure faith. Until we picked up our new car, our only exposure to a Tesla, or any type of electric vehicle (EV) for that matter, was an occasional sighting on the road together with whatever we could read about the car. We never drove one, and we never even sat in one. We put our name on the waiting list for a new Model 3 around the middle of 2016 with the intent to purchase the $35,000 base model. And then we waited and wondered if we were doing the right thing, knowing that we could walk away from the deal. We decided to ignore all the bad press and instead tried to learn what we could from actual Tesla owners. We took the opportunity to talk to any owners we could corner on the streets, and we subscribed to Teslanomics, which is a Tesla community website founded and run by an early Model 3 owner. What we learned encouraged us, and we began to question not whether we should buy the Model 3, but whether we should upgrade our sights to the performance model with the long-range battery. At the end of June this year we got the email from Tesla saying that we could now configure our Model 3 with delivery of the performance model in the 4th quarter. Shortly afterwards, Tesla hit the threshold that triggered the phase out of federal rebates. That encouraged us to shell out the additional $14,000 to get the car before the end of the year, giving us the long-range battery plus upgraded interior, with the government effectively subsidizing $3750 of the increase. On July 22, 2018 we drove our new car home. So how do we like the new Tesla? The short answer is that we love it. We are not “car people” and have always bought practical cars that seemed to best fit our lifestyle at the time and have never gone for expensive models or options. But we have rented and driven high-end cars like BMWs, Mercedes, and Porsches. Of course, they’re nice, but the Tesla is by far the nicest car we have ever driven, let alone owned. It is roomy (I’m 6′-3″ and fit easily); it is comfortable (5 adults can fit with only a bit of a squeeze); it has an amazing amount of trunk space (huge rear trunk and bonus “frunk” in front); its acceleration has to be experienced to be believed (you can easily make your passengers sick, if you’re not careful); it is wonderfully quiet (to the point that you have to relearn how to gauge your speed without engine noise). What are the negatives? So far not much. There are some adjustments you need to make. For example, you have to get used to the fact that you don’t turn the car on or off. After 4 months, we still get strange feelings just putting the car in park and walking away from it. You find yourself listening to make sure you hear the beep when the doors lock. Note – they always do! We did have one early incident where my wife backed out of the garage, and the car just stopped. Nothing she did would get it to respond. Normally that would trigger a call to AAA or a towing company. But she called the Tesla service number. In a matter of minutes, the tech determined that the problem was a setting in my wife’s phone app that made the car decide she wasn’t authorized to drive. He was able to reset it, and she was ready to go. Bottom line – this is a computer on wheels with a big battery to make it move. What about charging? Charging has required our biggest change in behavior . Our house has old wiring and only supports 110V service, which means that recharging the vehicle is very slow – 5 miles per hour. If one had to commute to work every day and could charge the car for only 10 hours every night, you are talking a 25-mile one-way commute. We’re retired, so not an issue, but we still have to think through our weekly driving plan to make sure we have sufficient battery for everything. Is it an annoyance? Yes, but compared to weekly trips to the gas station and pumping our own gas, we’re more than happy to take on this additional process. And, every time we feel like sighing when we go to the garage to plug the car in, we just think about paying about 5 cents per mile in electricity compared to 20 cents per mile in gas for the car we replaced. And then there are the intertwined issues of driving range and recharge time. As mentioned above, we splurged on the extended range battery, which means we can plan on about 300 miles on a full battery charge. I convinced my wife that we should take the Tesla on a driving trip from our home near Los Angeles to Carmel on the central California Coast. It would be our first big adventure on the road and at about 360 miles one way, the first time with a Tesla Supercharging station. Although we were a bit nervous, it turned out to be pretty cool. On the way up, we stopped at a 10-charger station at the Marriott hotel in Buellton, right off the 101 highway. There were 4 slots open when we got there (the car tells us that). Simple as can be. You just pull up and plug the cord in. I kept looking for a place to put my charge card. Nope. When you plug the car in, Tesla knows it’s yours and automatically bills the credit card you have registered on the app. How easy is that? We spent awhile chatting with the woman next to us. She said the charging stations are somewhat of a social gathering for Teslaheads (my word, not hers, and when did you last spend 10 minutes at a gas station talking to someone, other than the guy who wants $2 bus fare to get home?) The Marriott had nice restrooms (a very pleasant change from your typical gas station), a restaurant, and some comfortable chairs in the courtyard to read (which is what we did). There was also a McDonald’s two doors down. We ended up spending about 45 minutes, but it seemed much quicker than that. The Tesla app even keeps you updated on the status of charging and warns you about 10 minutes before it finishes. On the drive home, we tried a different supercharger at the Madonna Inn in San Luis Obispo. Once again, we had about a 40-minute recharge, but there’s a nice coffee shop at the Inn, and, perfect for us, a Starbucks about a block down the road. We took our Kindles, had a latte and relaxed. No doubt the trip took longer than it would normally, but even my wife, who likes to get places quickly, said that it was about the most relaxed long driving trip we’ve ever taken. After 4 months of ownership, we’re sold – on the car, on the technology, on playing a more proactive role in reducing our fossil fuel use, and on the subtle changes in lifestyle that come with such a vehicle. Once you drive one and get to experience these feelings, I think you’ll agree that the internal combustion engine is a technology that cannot survive the competition. The only question is when. And I’m betting it’s a lot sooner than experts are currently predicting. I’m forever impressed by your work ethic, and your analysis of the Tesla Model 3 is no exception. My experience with Teslas is limited to seeing them quite infrequently on the road and even less frequently in what seems to be an over abundance of charging stations wherever Martha and I travel. We do see them more often when we are in California on visits to our Ventura daughter and family than we do here in Texas. We took a liking to Cadillacs several years ago beginning with a CTS, then a SRX and presently a CT6. It is essentially a big luxury sports car and very, very close to being self driving. It has a 3.0 liter twin turbo engine which consistently gets 28-31 mpg on road trips with speed limits up to 85 mph in several areas of of Texas. So, as long as we’re buying gas at $2.15-$2.40/gal our fuel cost is about 8 cents per mile or less. We have put on nearly 37000 miles since December 2016. That includes two trips to El Paso, one to Ventura, one to Santa Fe, NM, one to NYS and recently one to New Orleans via Morgan City as well as numerous trips to daughter Cynthia and family in Waxahachie and Martha’s hometown of Kerrville. I didn’t realize you were also a Teslahead!. My wife and I took ownership of a Model 3 in December 2018 and have been loving it ever since. The change from a combustion engine to electric was dramatic for me. My previous vehicle was a full size 4×4 truck that was lucky to get 15 miles to the gallon. I do miss being up high and being able to throw mulch or hunting gear in the back. The change to electric was a result of a long daily commute. About 80 miles round trip plus weekend driving. I was on pace to drive over 30k miles per year. The 4×4 was costing me about $400 per month in gas, plus oil changes. I started having issues with the truck such as exhaust manifold leaks, alternator issues, rough idling that required frequent trips to the dealership for repairs and maintenance. I knew I needed to make a change to a daily commute car that could handle the long drive and wouldn’t be a burden to drive. The other EV’s I looked at had bad performance, slow acceleration, and minimal range. I researched the Model 3 for a few months and finally drove one. I was grinning from ear to ear. The acceleration is just relentless. After the test drive I went home and ordered. We sprung for the Model 3 all-wheel drive with 310 miles of range. We installed a 40 AMP circuit at the house that I plug into each night. It takes about 2 ½ hours a night to replenish the 80 miles I used up for the commute. Costing me about $40 per month in electricity. We are planning on transferring to a new utility provider that offers free electricity from 12 am to 3 am. So the nightly charging will be free! One my favorite thing about the Tesla is the amount of data I get from the car. No only mileage but what makes it more efficient. Such as changes in temperature, elevation changes, tire pressure, etc.. I guess it appeals to my interest in data mining.